Endocrine-disrupting chemicals (including BPA, Triclosan, and Salicylic acid) as you may already know, can be found in many plastics and pharmaceuticals. They are known to be harmful to wildlife, and to humans in large concentrations, resulting in negative health effects such as lowered fertility and increased incidence of certain cancers. They have been found in trace amounts (parts per trillion to parts per billion) in treated wastewater, and also have been detected in water samples collected from Lake Mead in Nevada. 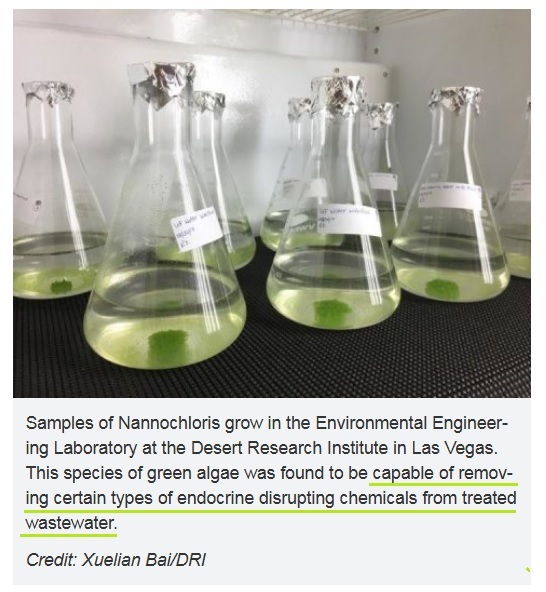 In wastewater samples that had been treated using an ultrafiltration technique, the researchers found that the algae grew rapidly and significantly improved the removal rate of three EDCs (estradiol, ethinylestradiol and salicylic acid), with approximately 60 percent of each contaminant removed over the course of seven days. The scientists hope their research will draw public attention to the fact that treated wastewater is not 100 percent clean, and will also be helpful to utility managers as they develop new ways to remove untreated contaminants from wastewater prior to release. The scientists are now working on a new study looking for antibiotic resistance in genes collected from the Las Vegas Wash, as well as a study of microplastics in the Las Vegas Wash and Lake Mead. Previous Food Additive Hinders Flu Vaccine?